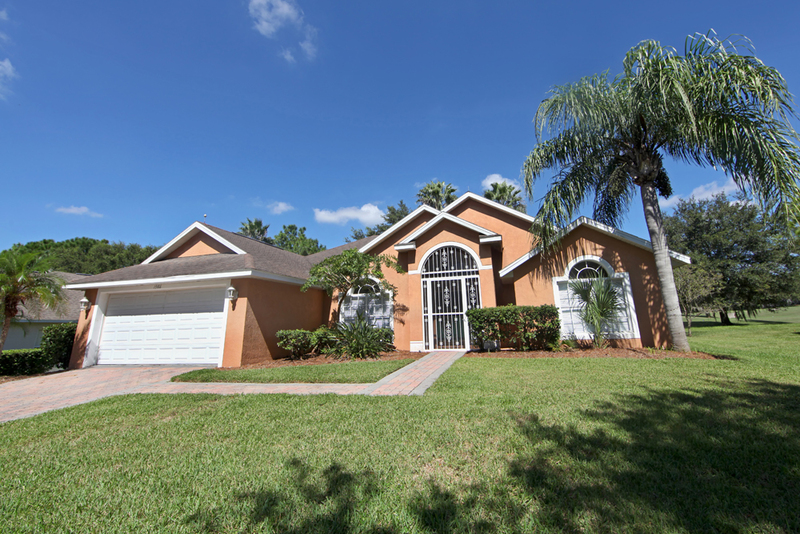 How’d you like to stay in a 4-bedroom, 2-bathroom, single-storey vacation villa with private pool that’s on the golf course? Of course, you would! 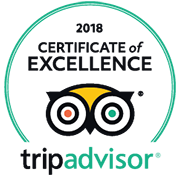 Read on to see what else you think about this place. A couple of things you’ll notice when walking throughout the house is that there’s hard flooring throughout the communal areas, and the ceilings are vaulted, which makes each room feel larger and more spacious. One place that definitely receives that affect is the living room. It’s quite large. 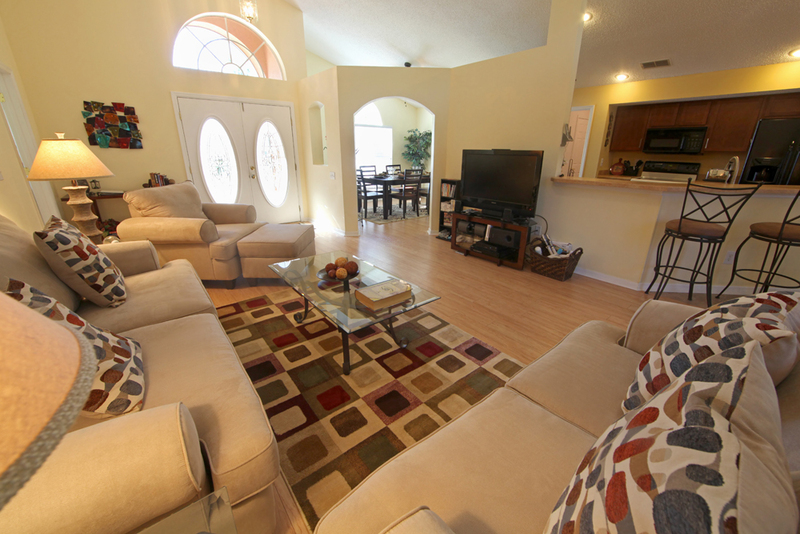 It also has 2 comfortable sofas, an armchair, a flat screen TV, a Wii, and patio doors that let natural light in and also let everyone out onto the pool area (we’ll talk about the pool in a bit). 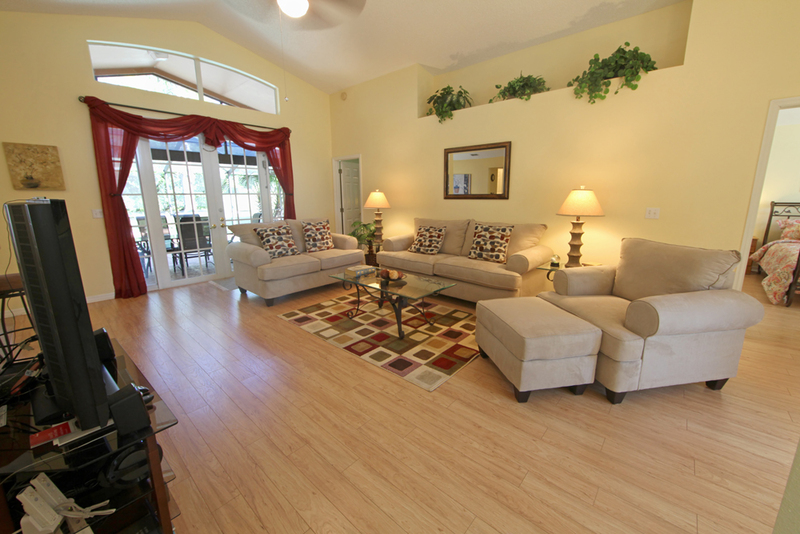 The living room will be the place you most look forward to going to after a long day out at the parks. 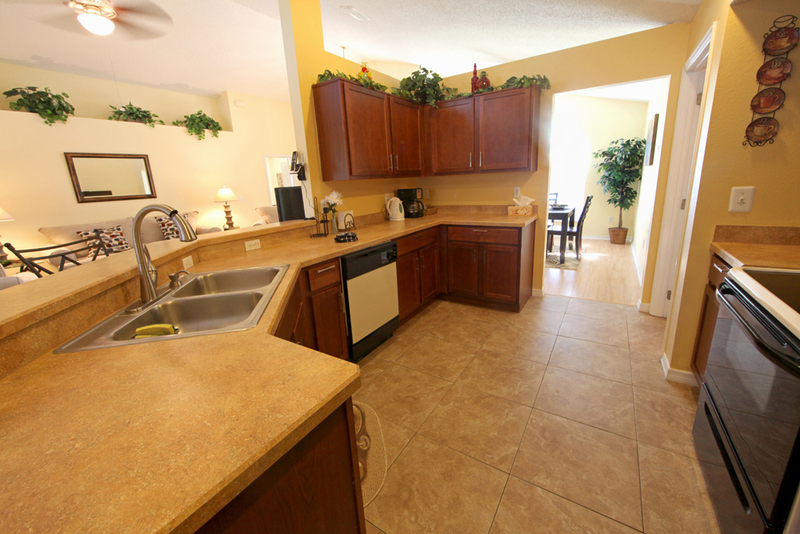 The kitchen, which overlooks the living room, is a decent size. 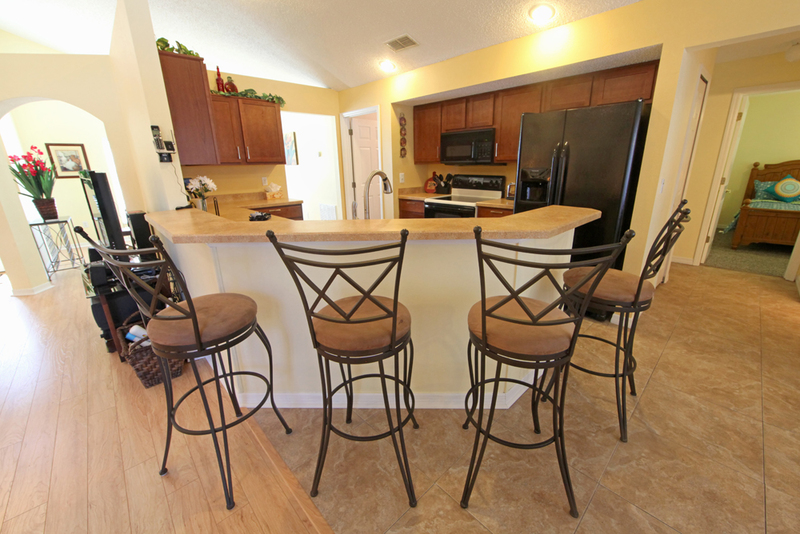 It has dark wood cabinetry, black appliances, a breakfast bar that seats up to 4 people, and, most importantly, it comes fully equipped with all the bowls, utensils, small appliances, etc. that you’d need in order to cook or eat. 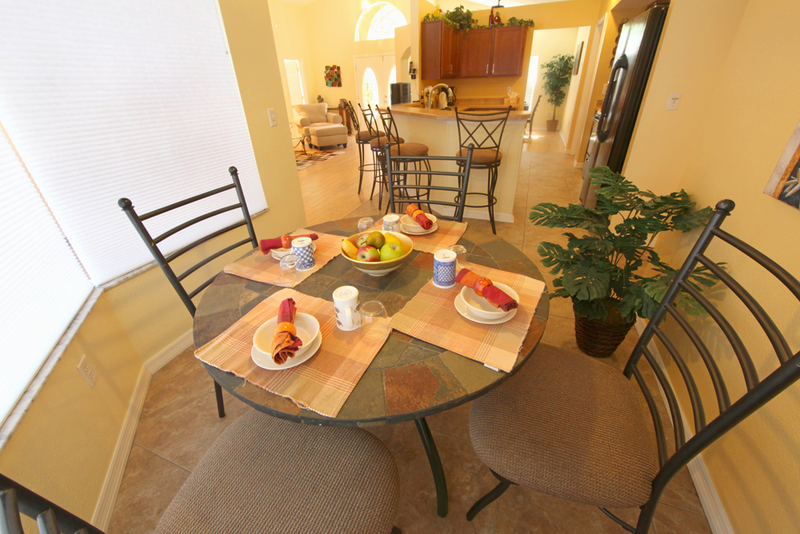 In addition to the breakfast bar, there are two additional dining areas. 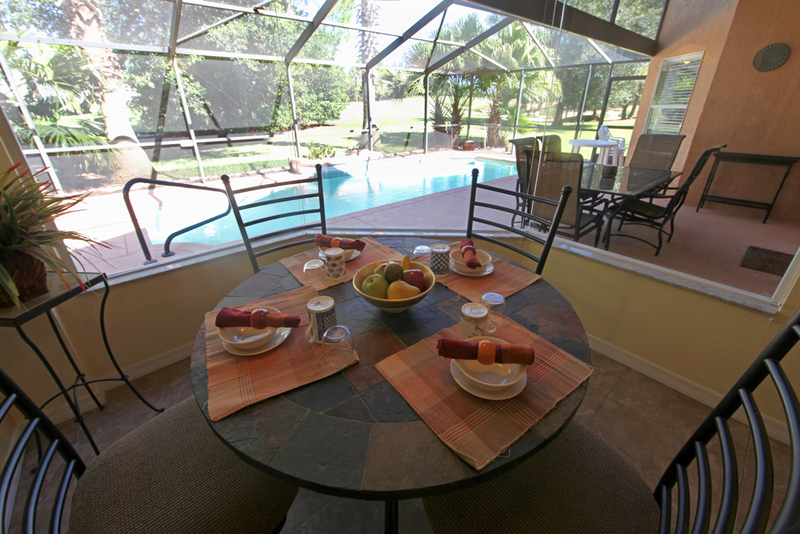 The first is the breakfast nook area, which also has 4 chairs and is inside a rotunda-like room that has great views of the pool and golf course. Need more seating? No problem! 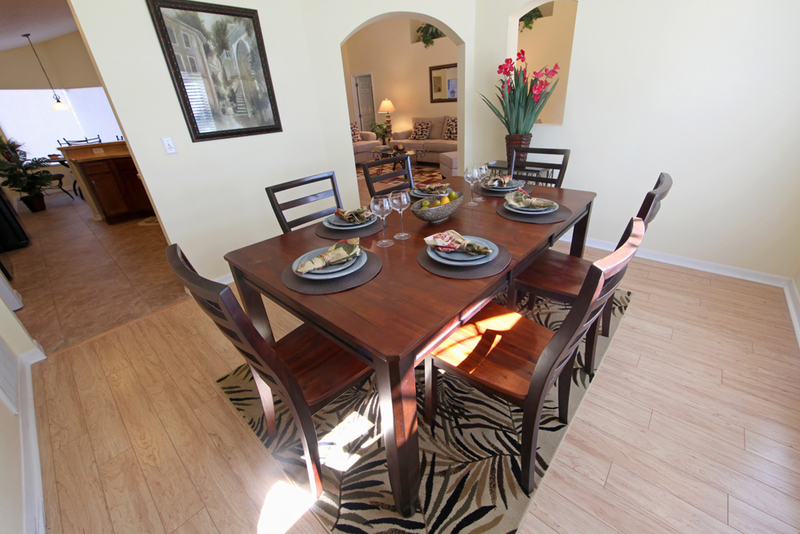 Behind the kitchen, there’s a dining room with a dark wood dining table and 6 seats. Needless to say, there are plenty of places to sit down and eat with one another. 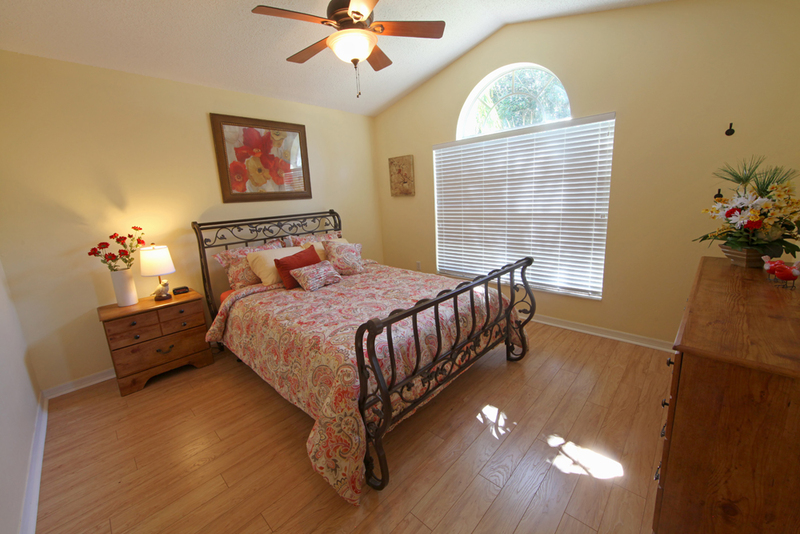 Head through those patio doors in the living room, and you’ll be in the screened-in pool area. 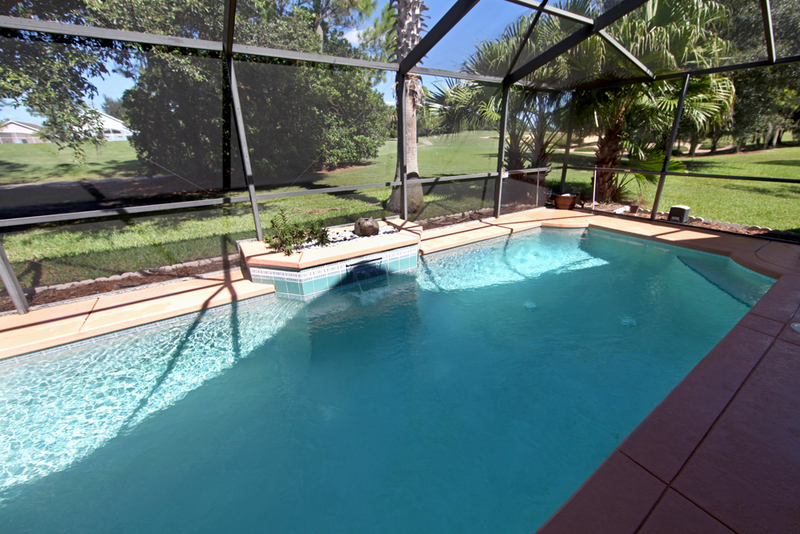 Here, you’ll find a large pool that’s perfect for cooling off in after being out in the Florida heat all day. There are also some sun loungers for those who want to work on their tans. 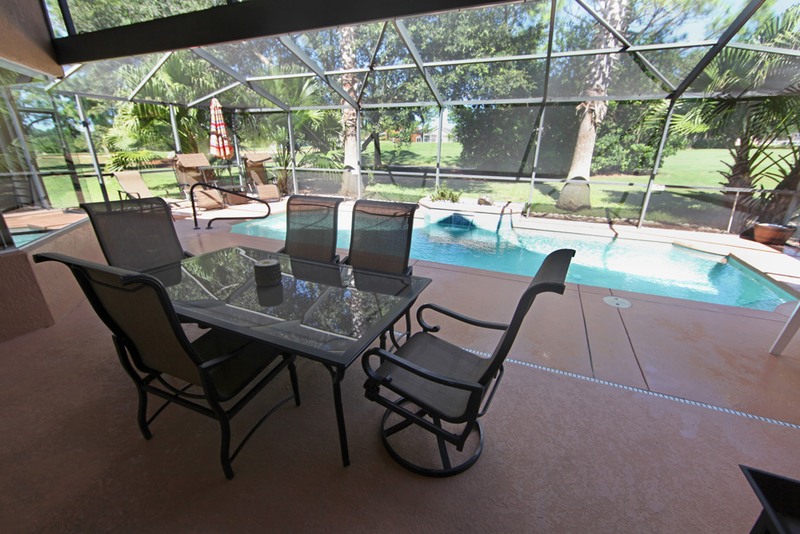 For those who want to be outside but out of the sun, they can take a seat on a patio chair underneath the large covered lanai. 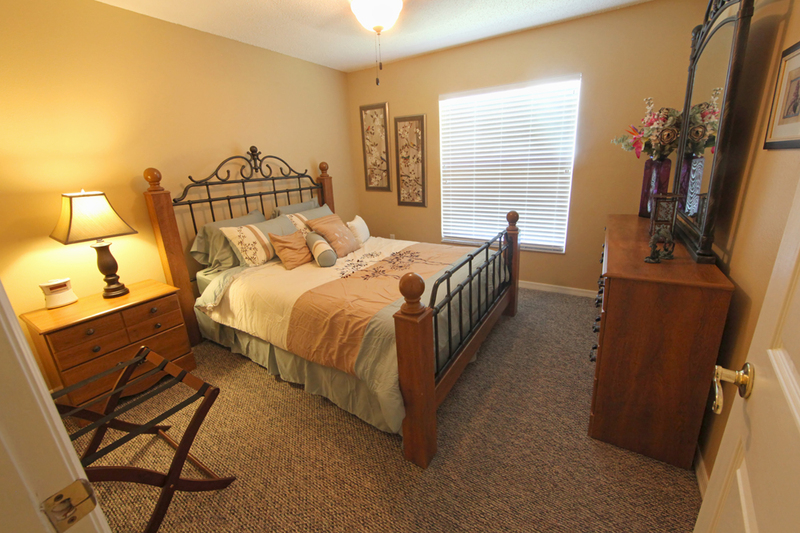 There are 4 bedrooms. 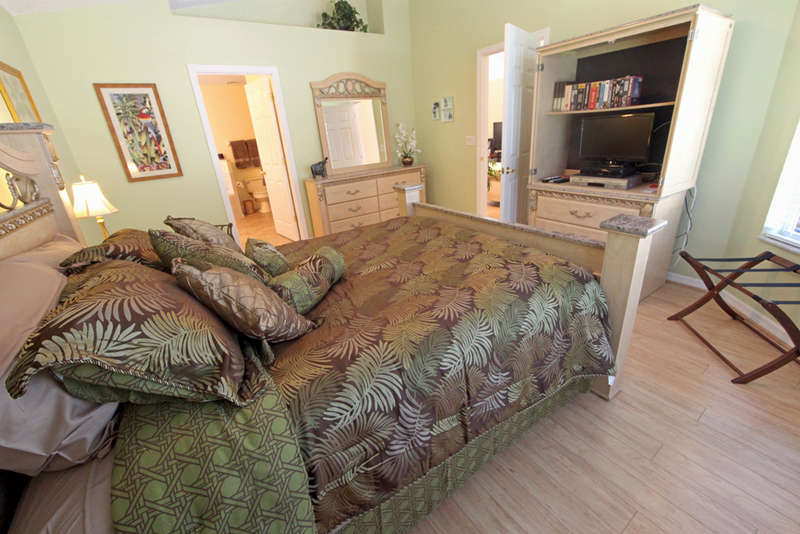 The first three bedrooms, including the master bedroom, all have queen-size beds. 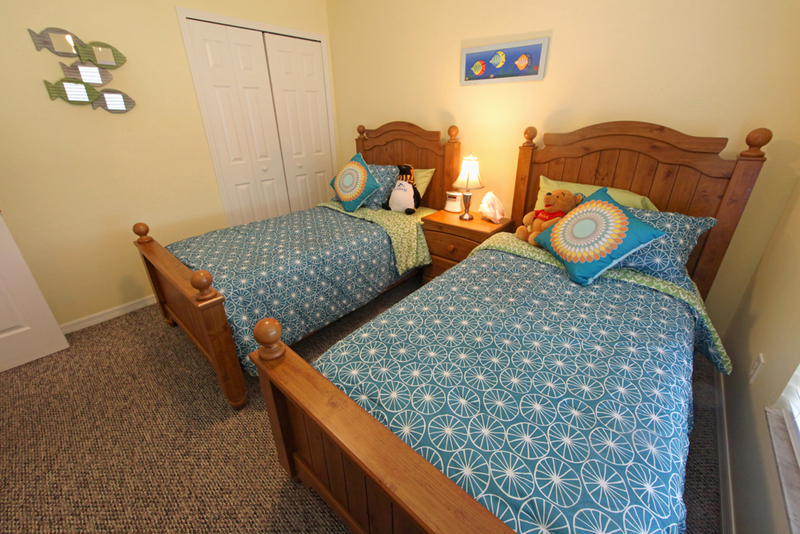 The fourth bedroom has two single beds, which are perfect for kids.